In this paper, a methodology for 3D object partial matching and retrieval based on range image queries is presented. The proposed methodology addresses the retrieval of complete 3D objects based on artificially created range image queries which represent partial views. The core methodology relies upon Dense SIFT descriptors computed on panoramic views. 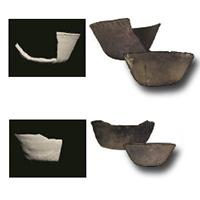 Performance evaluation builds upon the standard measures and a challenging 3D pottery dataset originated from the Hampson Archeological Museum collection.